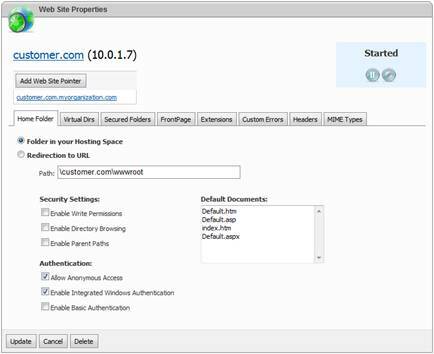 Select Folder in your Hosting Space option to point web site to some folder within the hosting space. You could change web site root folder from default one wwwroot if it was allowed in the hosting plan. Select Redirection to URL to redirect all requests from client application, such as web browser, to another Web site or virtual directory by entering a URL in the box below. Tick Enable Write Permissions option to allow web site users uploading files and their associated properties to the enabled directory on your server or to change content in a Write-enabled file. Write access is allowed only when web browser supports the PUT feature of the HTTP 1.1 protocol standard. Tick Enable Directory Browsing to allow web site visitors seeing a hypertext listing of the files and subdirectories in this site. Tick Enable Parent Paths to allow web pages to use relative paths to the parent directory of the current directory (paths using the .. syntax). This option might be required for legacy ASP applications. Tick Allow Anonymous Access to allow anonymous connection to this web site. Normally, this option must be enabled for the most of web sites. Tick Enable Integrated Windows Authentication to require web site users entering their credentials in order to access the web site. Windows authentication ensures that the user name and password are sent across the network in the form of a hash. This provides secure form of authentication. Normally, this option must be disabled for the most of web sites. Tick Enable Basic Authentication to require web site users entering their credentials in order to access the web site. Basic authentication is part of the HTTP specification and is supported by most browsers; however, user name and password are not encrypted and could present security risks. Normally, this option must be disabled for the most of web sites.